I was given an opportunity to read & review (i.e. 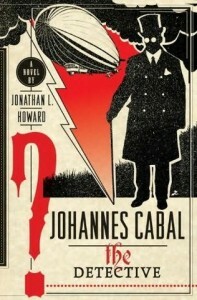 given a free copy) the latest book from Jonathan L. Howard, Johannes Cabal the Detective, the sequel to Johannes Cabal the Necromancer. You might be asking why I’ve chosen to review the book on Mad Brew Labs, which is an RPG blog. Well, fiction is a primary influence for gaming and I hear Howard is a bit of an RPG gamer himself (in fact he also does video game design). No worries though, I plan on approaching the review from an RPG world-building perspective as well as turn a bit of Johannes’ world into game crunch at the end of the review. I want to see more main characters in media like Johannes Cabal. He’s selfish, but not necessarily evil. His activities are not condoned by society, but he’s ambitious in his pursuits and he generally doesn’t give damn. From a not-so-different perspective, Johannes could be the villain of the story. Johannes Cabal is constantly struggling against his conscious and upstanding individuals around him as he makes logical, if antisocial, or even amoral, suggestions to solve problems. This is a character I can identify with. See, Johannes Cabal is a Necromancer (of some infamy), and in most civilized nations, necromancy is a crime that carries stiff penalties (including death). We find Johannes imprisoned in a Mirkarvian dungeon at the onset of the book, having been caught trying to steal a copy of the Principia Necromantica from the Special Collection of the library of Krenz University. Fortunately for Johannes, the Mirkarvian Emperor just died and militants in the Mirkarvian Empire were depending on the Emperor’s announcement of war in order to set off a chain of events to restore the empire to its former glory. So, Johannes is given an opportunity to escape the clutches of certain death if he can reanimate the dead emperor so he can make his dying wish. Unfortunately for Johannes, the Count that requisitioned his service didn’t have any plans to release Cabal. So during the chaos that ensued after a risen emperor began eating his guard’s brains during a public announcement, Johannes makes a break for it and tries to escape from Mirkarvia in an aeroship (or zeppelin). It’s during his flight from Mirkarvia on the aeroship that Johannes becomes embroiled in a murder investigation. Johannes begins the investigation in order to maintain his civil servant disguise but eventually is committed to finding the assassin when an attempt is made on his own life. Much of the book is centered on his investigation, all the while trying to maintain a stolen identity to escape Mirkarvian authorities. It’s full of dark humor, satire, and Johannes generally trying to be antisocial. It’s a character driven story where the minor steampunk elements take a backseat and only serves to paint in the background (which is a good thing!). I think my favorite part of the story is really the epilogue. The epilogue is narrated by an individual who must team up with Johannes after his escape in order to survive an encounter with some bandits and ancient sorcerer they happen to accidently set free from imprisonment. Howard took a great approach to world-building with his Cabal books. They are sort of an alternate history of Earth. He manages to reinvent the world just enough that he can simultaneously take advantage of elements readers will already know about while ensuring they won’t also get bogged down in the details of actual history. I think many DMs and designers could actually take lesson from how Howard built the world of Johannes Cabal. It shows that you can take advantage of a familiar setting (real history, established RPG worlds, fictional locations) without worrying about the baggage that comes with it. Unless you have some real douchebag players that refuse to compromise. Jonathan Howard took the real world and inserted fictional nations, which Mirkarvia belongs to. You can definitely see their influences (Mirkarvia definitely has some Austrian-Prussian flavor). With the addition of the esoteric and unrealized technologies (necromancy & steampunk), he can manipulate the expectations of his audience. When you obviously break an established element, your audience won’t know what to take for granted. You can then begin to rebuild their expectations by re-establishing those elements you wish to keep. For example, Howard re-asserts British culture by inserting certain elements throughout the story. It can be a tricky process to master, but I think it is one well worth learning. I think such an approach to world-building works best when you want to make use of powerful existing atmospheres (e.g. re-inventing Ravenloft) or if you want to back-fill a lot of geography or history while exploring a what-if scenario. Slot —; Weight 4 lbs. Only a few copies of this book are known to exist. The original copy was penned in blood on pale leather pages worked from the skin flayed from the abdomens of 333 virgins. The original Principia Necromantica was created under the tutelage of a powerful demon lord by an accomplished necromancer whose name has been struck from history. An interesting aspect of the Principia Necromantica is that the pages are not static, but are constantly changing and evolving. The effect is supernatural and can be maddening to the weak willed, forcing any character that invokes one of its powers to make a Will save (DC 20) or suffer 1d4 Intelligence and 1d4 Wisdom drain. The Principia Necromantica contains knowledge, incantations, and stored magical energies that enable a character to animate the dead. Characters may utilize the book as a library to make Knowledge (religion) checks (they may make checks with a DC higher than 10 untrained, but it takes 1d4 hours of research) with a +5 competence bonus. A character may invoke the Principia Necromantica to cast animate dead at a caster level equal to his character level once per day. The spell does not require spell components. This books increases the amount of undead a character may control by 2HD per character level. The Principia Necromantica may be destroyed if the burial site of the 333 virgins sacrificed during its creation is consecrated. Once their grave is consecrated, the pages will boil away into vapor never to return again. [Special thanks and an apology for this taking so long to see the light of day to Matt Staggs, the publicist to who sent me the book].